"Various Types of Telegraph Instruments, Part II"
Welcome back to the Telegraph Office. This month we are going to continue our talk about the different kinds of telegraph keys and related instruments that there are to collect. Again, I have included some beautiful engravings to illustrate the various instruments. If you have any questions, don't hesitate to send me Email. Remember that telegraph instruments can be classified into three categories, landline instruments, wireless / radiotelegraph instruments and submarine cable instruments. Last month we took a look at landline instruments. Now let's take a look at wireless/ radio telegraph. In landline applications the key carried probably no more than one quarter of an ampere of current. In wireless applications, the current and voltage that the key was required to handle depended on the power of the transmitter keyed. The key was directly in the primary circuit of the spark transformer. For larger transmitters, the primary would be several hundred volts at tens of amperes. Consequently the contacts on a wireless key were large in comparison to landline keys. The contacts of larger wireless keys were replaceable and made of silver. On very large keys one or both contacts were equipped with cooling fins as large as two inches in diameter. On some keys to protect the operator, a skirt about the size of a poker chip was placed under the knob. To accommodate the large contact, some wireless keys are quite large, some weighing as much as ten pounds and being over a foot long. Often the base was made of slate or marble. Keys made for the U.S. Navy had two threaded rods which were used to bolt the key to an operating table. The rods also doubled as the means to attach the key to a circuit. One of the premier keys of the late teens was the Clapp-Eastham key; it was well constructed and had an Italian marble base. 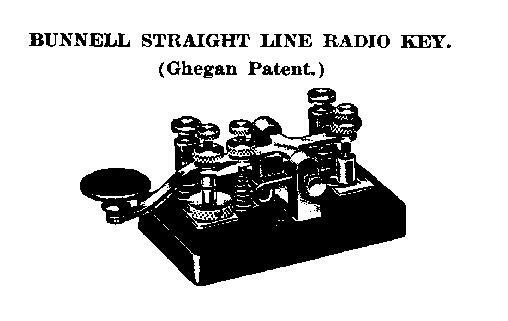 The Clapp-Eastham name is familiar to antique radio collectors. Sears and Roebuck sold spark keys manufactured by A.W. Bowman. Relays found application in wireless telegraphy also. Often times the operator was in one room and the transmitting equipment was in another room. 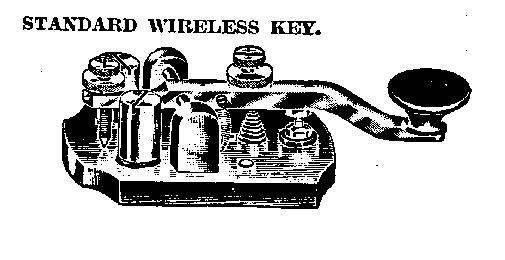 Relays with large contacts, as described above for keys, were used in conjunction with a small landline key to control the transmitter. The spark key was short lived. They were needed for only a little more than a decade. With the advent of vacuum tube transmitter in the early 20s, the current carrying requirements diminished the need to have large keys. Radiotelegraph keys and landline keys became largely indistinguishable except for slightly larger contacts. There are many varieties however. Ted McElroy made bugs from the mid 30s to the early 40s. McElroy won many code copying championships in the 20s and 30s. He capitalized on this fame to sell keys and bugs. The 1938 Deluxe model with the simulated marble base is prized by key collectors. The art deco "Super Stream Speed" is also desirable because of its unusual base shaped like a tear drop. Many collectors specialize in the "J" series of keys. The U.S. Army made keys from "J-1" to "J-181" and beyond. So you can see that there are more than a handful to look for. There is even a book on the subject. You have probably seen many, many J-38 keys and J-36 bugs at flea markets. The U.S. Navy also had many varieties, with the "flameproof" key being the most often found at flea markets. We will continue our discussion of telegraph instrument types next month. Stay tuned for the fascinating subject of submarine cable telegraphy. In the meantime, I'd be happy to hear from you.